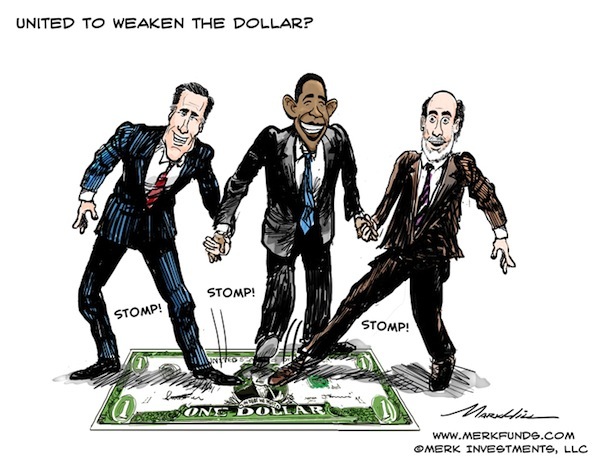 Merk Insights - U.S. of A(sia) - United to Weaken the Dollar?! U.S. of A(sia) - United to Weaken the Dollar?! Our leaders want a weaker dollar and a stronger Chinese renminbi (RMB). That’s our assessment based on recent comments by President Obama, presidential hopeful Romney and Federal Reserve (Fed) Chair Bernanke. If you join them in that call, OK, just be careful what you wish for, or at least consider taking action to protect your portfolio. In the past few weeks, Bernanke has become ever more vocal in encouraging emerging market countries to allow their currencies to appreciate against the dollar; and Obama and Romney have both been advocating for a weaker dollar versus specifically the Chinese RMB. In the recent presidential debates Romney continued his call for declaring China a currency manipulator, and Obama proudly stated that the RMB had appreciated 11% against the dollar since he took office. It has actually been about 9% according to the data we look at; nevertheless, the point that both were clearly trying to make is that a weaker U.S. dollar is in our economic best interests. Likewise, in an IMF speech Bernanke essentially admitted that accommodative monetary policy in the U.S. causes upward pressure on foreign exchange rates between emerging market currencies and the dollar, and suggested that foreign central banks allow that dollar depreciation to take hold, rather than intervene to prevent it. It may be superficially plausible that RMB appreciation is the key to alleviating our economic woes, by promoting exports and therefore jobs in the U.S. However, while lowering one’s currency might give a boost to corporate earnings for the next quarter (as foreign earnings are translated into higher U.S. dollar gains), it is difficult to imagine that the U.S. can truly compete on price – the day we export sneakers to Vietnam will hopefully never come. An advanced economy, in our assessment, must compete on value, not price. Without discussing the merits of this argument in more detail, let’s look at the flip side of a stronger RMB, which is a weaker dollar and potentially higher prices for goods imported from China. Notice that there is a lot of table pounding about China stealing manufacturing jobs, but no protest when it comes to the low prices consumers enjoy as a result of China trade. After all, not all Americans are producers of export goods, but certainly all are consumers of goods in general, many of which are imported from China and emerging Asia. We agree with our policy makers to the extent that the dollar may be generally overvalued and many Asian currencies undervalued; and therefore the path of least resistance may lead to Asian currencies grinding higher across the board. The below chart illustrates this trend. China’s appetite for currency appreciation against the dollar may have a good deal to do with its currency’s relative strength or weakness compared to its Asian neighbors, who are export competitors. 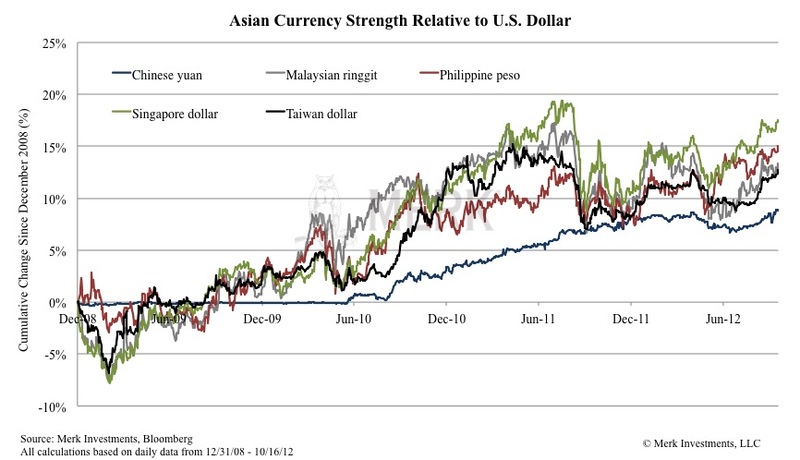 As these other Asian currencies appreciate they provide the RMB more room to appreciate as well. While many Asian currencies may rise over the coming years, we think Asian countries like China, that are moving up the value-added chain, are in a better position to handle more rapid currency appreciation than others. As production processes become more complex, it is harder for low-price competitors to easily replicate that output. As such, higher value-added products provide China’s exporters with greater pricing power in the global market, limiting the need and effectiveness of a cheap currency policy. Additionally, over the medium to longer term, as the Chinese economy continues to grow and the middle class becomes wealthier, domestic consumption will play a larger and larger role in their GDP, and that shift away from economic reliance on the American consumer will also diminish the need for an export oriented currency policy. In fact, we believe a stronger RMB will be beneficial for the Chinese consumer and help that transition along. The gradual shift towards greater domestic consumption is occurring in many other Asian countries that have been following the export growth model and, as Bernanke puts it, that “systematically resist currency appreciation.” As we can see in the above chart many Asian currencies haven’t been resisting appreciation as much as you might think, and this gets to Obama’s point on the RMB appreciation since he took office. From an investment standpoint, 9% in four years isn’t a bad return in this environment; it would take over 78 years to reach that return rolling 3-month T-bills at their current yield of 0.11%. American consumers (and Chinese exporters) have been subsidized by the artificially weak Chinese currency, to the detriment of Chinese consumers who have faced stunted purchasing power. However, we believe this dynamic will continue to change and suggest that a stronger RMB is very likely not only on Bernanke, Obama, and Romney’s wish list, but increasingly in China’s own interest. That would mean the tables getting turned on the American consumer. By the way, there is a good reason no President has called China a currency manipulator. Once China is labeled a currency manipulator, it sets in motion a process in which Congress takes up the matter. Without going into detail, our recent Presidents have preferred to seize rather than delegate power: by calling China a currency manipulator, the President would essentially tell Congress to have a stab at the issue; whereas the President has far more flexibility at the executive branch in dealing with China without consulting with Congress. Once Congress gets involved, the threat of a trade war does become more likely. Even if Romney is correct that China may have more to lose in a trade war, our analysis shows that the currency of a country with a trade deficit may be under more strain in a trade war. That may well be what Romney wants to achieve, but again, be careful what you wish for. If part of what investors consume is produced in another region, then holding some local currency or local currency denominated assets may be prudent. American consumers should ultimately not be concerned with the number of dollars in the bank, but rather with what those dollars can buy in terms of real goods and services. We suggest that Bernanke may be the currency manipulator to be more afraid of, and moreover, that our de-facto weak dollar policy may be reason to take the purchasing power risk of the dollar into account. Please register for our Webinar on Thursday, November 8th, 2012, where we will dive into implications of US policies on China and Asian currencies in more detail. Also sign up to our newsletter to be informed as we discuss global dynamics and their impact on gold and currencies.